■ Five years since the US and her allies invasion, the Afghan people’s level of the misery and agony is rises at an alarming rate. ■ The American forces act so reckless and hasty in killing innocent civilians everyday, that they seem to have come here for taking revenge of the 3,000 victims of the 9/11 from the people rather than to targeting the terrorist of their own creation, the Taliban. The death toll of these innocents throughout Afghanistan is now much higher than that of 9/11. This has indeed provoked and enraged the wrath of the people, encouraging the Taliban terrorists, who definitely receive the maximum benefits. ■ Instead of explaining the reasons for spending billions of dollars in waste, the corrupted heroin-lord Ministers impudently talk about their “achievements” through a mockery show during “Accountability Week”. ■ The top US-Karzai backed criminals of the Northern Alliance, such as Sayyaf, Rabbani, Qanoni, Khalili, Kazimi, Dostum, Chakari, Massoud Zia, Mohaqiq, Anwari, Atta, Dr. Abdullah, Ismail, Danish and alike were not put on trial. Instead the government has allowed these scoundrels to pass the heinous bill of so-called National Reconciliation, which only paves the way for their own exoneration. These Northern Alliance thugs recently formed the National Front by joining with the Khalqies and Parchamies, Gulbaddinis, Taliban elements and some bankrupt followers of Zahir Shah. Such a display only proves that criminals like Gulabzoy, Ulomi, Ranjbar, and Rabbani, Qanoni, Kazimi and others unite when the time comes for them to feel the rage and hate of the people they have victimized rise up against them. The most disgusting point of this farce is the presence of Mustafa Zahir in the Front, who in fact drove the last nail in the coffin of the “father of the nation” and royalists. Mustafa, who aligns himself with the infamous Rabbani, recalls the great poet Shelley who wrote: “Man will never be free until the last king is strangled with the entrails of the last priest”. ■ The US first installed the Northern Alliance criminals. Now they find ways to share power with Gulbaddin, Taliban terrorists, using Mojaddedi, their former godfather as the mediator just to get out from the current swamp. This indicates more than ever the dependency of the Afghan government and the true nature of the so called “War on Terrorism.” As has been proven again and again, the US and the UN look only for their vested interest in Afghanistan and do not care for the freedom, democracy and prosperity of Afghan people. The Bush Administration and the UN bring the most insane fundamentalists and Khalqies and Purchamies traitors to one table, and once they grind their teeth to each other, they will use one against another. ■ The CIA has unleashed Jabar Sabet on his various rivals through the drama of “enforcing law and justice” to fan the flame of the enmity between them. When he fiercely clashed with Atta Mohammad or one of the corrupt family members of Mojaddedi, the CIA just stared and kept deadly silence. 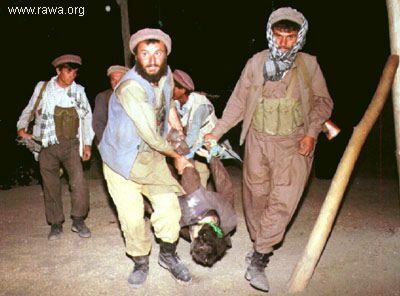 ■ Tolo TV was attacked and the government failed to stop the Taliban’s vicious beheadings of Saeed Agha and Ajmal Naqshbandi. Such acts should awaken the media and show them the root cause of the entire government’s corrupt nature, instead the media simply point to this or that particular government official, such as Khuram or Sabet. They can prove their loyalty to the people only when fearlessly disclosing the true face of the government and its support countries. ■ The pro-government intellectuals and politicians cry, blaming Pakistan as the only cause of Afghanistan’s ongoing tragedies. Yet they forget that many of their lords like Rabbani, Massoud, Sayyaf, Qanoni and others grew up, were nurtured and became “leaders” through the ISI with some still continuing to worship this agency. On the other hand, suppose this or that circle in Pakistan stopped supporting the Taliban, will the current crisis end? Will the barbaric rule of the Northern Alliance criminals cease? Afghanis who love their country know the answer: “No!” With the Iranian regime’s interference obviously being far more dreadful than that of Pakistan’s, Karzai cannot wrap his government’s failures in this garb any longer. A rein of terror imposed by the Taliban and the “Northern Alliance” terrorists prevailed across the country and requires fearless struggle. The last five years have given a clear message to our people, particularly the anti-fundamentalists and democratic forces, that neither the US nor any outside force can liberate this ill-fated nation from the fetters of the fundamentalists. Instead we require a decisive and united struggle, relying on our own power, courage, and daring sacrifice as we unite with freedom-loving people around the world. Although the Afghan people have a history of resisting foreign aggressors, they have shown patience and tolerance to the internal tyrants. It is the duty of revolutionary and anti-fundamentalist forces to unite all the misery-stricken people against all brands of fundamentalism. Disappointment yields nothing for us! The traitors of April 28 and April 27 combined their forces to tighten the grip over the people. Only a mass uprising can break up these anti-people forces. We will not be deterred in our devotion to a free and safe Afghanistan.